Probably, many people think, that the comparison of regional significance cultural heritage «Linen-combine — a large industrial enterprise of the region, built in 1932-1936″ with the greatest architectural monument — the Coliseum is inappropriate … The first – is just a plant, which is engaged in the linen processing and linen fabrics producing, the second is the one of the most spectacular buildings of the ancient world that have survived to our time. At the same time, without pretending to the world grandeur, the Smolensk Linen-combine was huge, colossal (from the lat. Coliseum means colosseus — huge, colossal) enterprise for the Smolensk region. The official laying of the foundation was on May, 1, 1934, and in January 1941 a government commission took it to a number of existing ones. In 1941-1943, the enterprise was completely destroyed by the Fritz. Despite the difficult conditions on the front line in October 1943 the renewal of the enterprise started, and in September, 25, 1944 the company workers gave the first goods. After the starting of underlinen and delicate sections in 1956-1957, the enterprise began to produce fabrics with a complete finishing. Full restoration project of the linen-combine was completed in 1958. The industrial complex of the Smolensk Linen consisted of more than 10 industrial, administrative and residential buildings, was surrounded by a security wall. The company occupied the building area of 6.1 hectares. The company had four canteens and one preparation room – totally it has 700 spots, a shop for the workers, where they bought the food. The Linen-combine had its housing stock (over 40 thousand sq. m.), 10 childcare institutions with 1240 spots, a summer camp with 360 spots. By the January, 1, 1975 the company employed 4456 people. 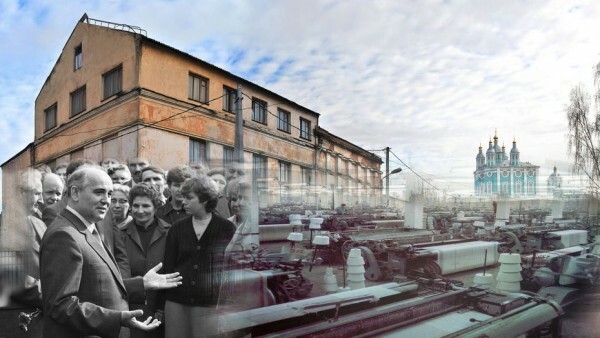 In the 60-80s of the 20th century the Smolensk Linen-combine became one of the leading companies of the country. The goods of the Smolensk linen — combine ware known not only in Russia but also in many foreign countries, the enterprise exported products to Denmark, Norway, Cuba, Canada, Austria, Hong Kong and others. Linen fabrics of the enterprise were exhibited in the international exhibitions which took place in 1961-1974 in France, England, Canada, Morocco, Vietnam, Poland, Bulgaria, Czechoslovakia, Indonesia, Italy, Turkey, Nigeria, Germany, USA, Norway, Yugoslavia and many others. A linen tablecloth «North» in Plovdiv (Bulgaria) exhibition has been awarded with the Grand Gold Medal. The linen culture became popular thousands of years ago. After all, the Egyptian priests wore the flax garments as a symbol of «purity and light.» Pharaonic mummies were wrapped in linen. The famous Greek historian Herodotus mentions about the gift for Athens Rhodes, which represents a linen cloth, each strand of which has been twisted out from 360 very thin fibers. This cloth valued literally worth its weight in gold: on one scale put the fabric, on the other — gold bullion or gold coins. Linen – is an ecologically clean material. Linen is a great heat controller. The one, using linen clothes, feels comfortable in any weather. Linen absorbs moisture, including sweat, and it is a good heat — conductor. So linen fabric is very suitable for underwear, bed-clothes. An interesting property of linen, is that when it absorbs the moisture, it becomes much stronger than usual. Linen is stronger than cotton, and endures sunlight better. Linen is a natural antiseptic. Linen fabric kills the germs. This linen property people have appreciated long ago: they noticed that the wound under the linen bandages healed faster than the one under cotton. Even a small amount of linen fibers (10%) eliminates any static characteristic of fibre. Currently, from the large enterprise there is only a small part of the buildings, including the main office brick building with an annex-gym, located in the south-western part of the linen–combine territory, located at the address: New Moscow Street, h. 2/8. The building is used by the municipal budget educational institution open (replaceable) comprehensive school № 1 of Smolensk City.